Recent Events: Paul Frucht's Dawn was performed by the American Composers Orchestra at the 25th Annual Underwood New Music Readings in June 2016, where he was given the Audience Choice Award. 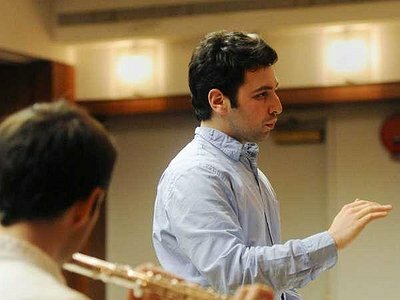 Musical Recommendations: Yuga Cohler is a 27 year-old conductor who is the music director of the Young Musicians Foundation Debut Orchestra in Los Angeles. Last year, he co-created with Stephen Feigenbaum a project called Yeethoven for the YMF Debut orchestra, which is a mash up of Kanye West and Beethoven. Another artist worth giving a look to is Robert Fleitz. He’s an incredibly accomplished pianist who’s superb with new. He also runs the Resonant Ground Initiative with bassoonist David Nagy which advances contemporary classical music by commissioning new works by exciting living composers. Website: If you enjoyed this interview with Paul Frucht, you can frind out more information about him on his website. I started composing when I was 14 and my first piece was for solo marimba as my original instrument is percussion. At that point in time, my main influences were the music I was playing in school band and in my local community orchestra. My father is also a huge classical music fan with an enormous CD library (that still grows to this day) so I had been exposed to a lot of the great masterworks from a very young age, though I didn’t begin playing percussion until I was 10. And though I knew the music of Haydn, Mozart, and Beethoven from orchestra and my dad’s CDs, I think I felt there wasn’t quite enough percussion for me to be satisfied with them as my primary examples (I’ve of course gotten over that since and now very much appreciate them). Instead, I was exposed to Percy Grainger’s band music and bought a CD of his most famous band works that I listened to on repeat. Eventually one of my percussionist friends told me I needed to branch out and introduced me to the music of Bernstein, Brahms, and Copland. The music of those composers, particularly Copland’s Appalachian Spring and The Tender Land Suite, became my biggest early influences. I really embrace emulation. Having grown up as a percussionist, the composers I imitated and continue to imitate are probably somewhat different than those imitated by composers who grew up as violinists or pianists. As you might have guessed from my answer to the first question, I emulated Copland when I first got to college, but experimented with writing similar music of those whose music I was playing as a percussionist such as Steve Reich or Phillip Glass. Throughout college, I studied the music of Bartok and Stravinsky extensively, even creating an arrangement of L’Histoire du Soldat for the NYU Percussion Ensemble, which had a lot of impact on my music. Towards the end of college, I discovered the music of Joseph Schwantner and Jacob Druckman. Those were the first composers who I emulated that truly made me feel at home. I took all that into my masters at Juilliard, where I finally learned to truly appreciate Schumann, Schubert, Chopin through intense study of their repertoire. It was at that point, with an expansion of my knowledge of contemporary composers to include my only two primary teachers - Robert Beaser and Justin Dello Joio as well as Steven Stucky, Aaron Kernis, Joan Tower and Kevin Puts among others, that I was ready to begin the process of discovering my own voice. When I first started writing music, I constantly found myself stuck in the middle of pieces because I struggled with form and creating a dramatic arc. I also struggled a lot with harmony, counterpoint, and writing long lines - none of which came naturally to me as a percussionist. Those were serious hurdles to get through. I really credit the European Musical Alliance program, run by Philip Lasser in Paris, for helping me confront these challenges. While there’s always room for improvement with any fundamental skill, the challenge for me now is using these skills to create the right music at the right moment or, in other words, using these skills to create form and a dramatic arc. When I was starting out, I remember writing a good chunk of a piece on a Metro North Train to New York. Gone are those days. These days, I have to be in a room with a piano (acoustic or electric) with absolutely nothing else going on in the background including ticking clocks. I write by hand at the keyboard and really try to put my computer and phone in another room. I have two tables next to me on either side for scores I’m studying, manuscripts, or room to write. I greatly prefer to have an iced coffee with me at all times when I’m writing, even in the winter, or at least some other type of drink. Mood, like in most other fields, is a factor. Like anyone, if I’m in a better mood and not preoccupied, it’s easier to focus. This was a huge problem when I was younger, but now I’ve learned that writing can ease preoccupation and I’m pretty good at focusing even when I have things on my mind. What’s more important for me is sleep. If I’m feeling tired, it’s really tough for me to focus and I’ve found that the music really suffers. So, unless I’m on a tight deadline, I just take a nap. Then I wake up, feel better and write music. I really like to figure out why I’m writing the piece before I start writing it. In the wake of the Sandy Hook shooting, I wrote Dawn in memory of the principal of Sandy Hook, Dawn Hochsprung. She sacrificed her own life that day for her students and having been a student of her’s, I felt compelled to write a piece in memory of her. With a piece like this which starts with a premise, the musical material comes out of that premise and substantively contributes to the narrative I’m trying to create with the given premise. Other pieces start with purely musical ideas. In these situations, I like to really think and figure out what about this musical idea is so appealing to me and what is something meaningful that I can do with it. Once I get those things straightened out, I come up with a rough arc for the piece and begin writing the first few measures. I’m always re-evaluating the form and will make changes to the plan or will go back and edit something I’ve already moved past chronologically. It’s also important to me to play through the piece everyday at the piano as the first thing I do every time I sit down to compose. It accomplishes several things. First, I really get to know the piece as intimately as possible this way, which I find more rewarding than MIDI because playing through it is a form of active participation that requires me to use my inner ear. Second, this often leads to a lot of great editing before I get to writing new parts of the piece. While that helps the piece for obvious for reasons, I also find it to be refreshing and to be a great warm-up activity. I’m in a place right now where I’m not drawing anything from electronic music or digital production tools though those are things that appeal to me for future exploration. Ask me again in five years! Timbre is incredibly important to me. As a percussionist, it was one of the first compositional elements I could really connect to, which was really my gateway into contemporary music. I’m constantly thinking about timbre in tandem with musical content. I also think timbre is incredibly integral to form. I’ve found that specific timbres can be used structurally in a piece in such a way that they can be brought back to create a sense of return, etc. I think in the late 20th and 21st centuries, timbre is at the forefront just as harmony is, if not more so.